Do you have a broken car window on your vehicle? Let us help you. 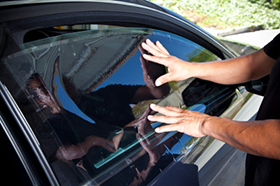 We will help you with your car window replacement. We understand that a broken car window is probably the most pesky thing you can encounter, especially if it is raining and you have the drive on the highway. Having a window is very important, it helps to keep cold or warm air from entering or leaving the car. It also helps to act as a security deterrant to theives. More often than not, if you choose another company to get your car window replacement you will end up waiting days for your parts to arrive. The great thing about working with us at Auto glass is that we have inventory for all makes and models of cars. We have our own fully stocked warehouse where we can immediately pull the parts that you need and install them into your vehicle. We want to get you back out on the road as fast as possible so that you spend less time in our waiting room. We have the lowest prices, the shortest wait times and the best customer service. All of our staff undergo routine trainings and have years of experience under their belt working with auto glass. We have our own on-site warehouse, which allows us to immediately pull the car window that you need and replace it for you, instead of having to call and order it which is typical of most other car window replacement shops in san diego. Because of our strong experience/training and our on-site warehouse, you experience wait times that are significantly shorter than that other other car window shops in San Diego. If you need a car window replacement because you were the victim of a theft. We highly cover the that you cover the broken window with something soft and to clean up all the glass before you get into the car. The last thing you want to do is get a cut while you are driving. Check out our other pages on Carglass1 Auto Glass Replacement San Diego and Carglass1 Mobile Auto Glass Repair San Diego, Ca they have plenty of information on our auto glass services. If you need immediate asssistance then please call our phone number now. We are always here to help!